Papaya, a revered tropical fruit was reputably called the ‘fruit of the angels’ by Christopher Columbus as it tasted superbly good. Papaya is an incredibly delicious, healthy and versatile tropical fruit that is loaded with essential nutrients and antioxidants. 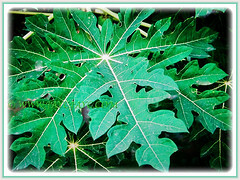 Botanical Name: Carica papaya (syn. : Carica peltata, Carica posoposa, Carica carica). 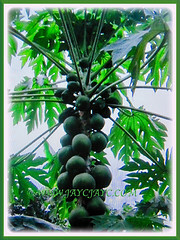 Common Names: Papaya, Papaw, Pawpaw, Melon Tree, Betik in Malay. Etymology: The genus name Carica was named by Linnaeus because the leaves of these plants are like those of the common Ficus carica. The specific epithet papaya is for fruit or tree. Origin: Native to the tropical region of America, mainly from southern Mexico to Central America. Plant type: A tropical tree bearing edible fruits, seeds and leaves. Features: Carica papaya is from the genus Carica that consists of 22 accepted species. It is a succulent and evergreen tree that can grow up between 5-10 m in height with an umbrella-like crown due to the canopy of palmate-lobed leaves. Its single, unbranched and non-woody lower trunk is conspicuously scarred of old leaf base. All parts of the plant contain latex in articulated laticifers. The deeply palmated lobed foliage with seven lobes are large, measuring 50-79 cm across. They are alternately arranged on the 1 m long petioles. Some Papaya trees are dioecious, that is, having male and female flowers in separate tree while others are hermaphroditic, having both male and female flowers in one tree. 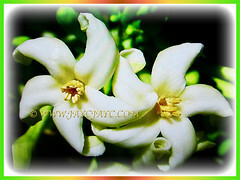 Fragrant, trumpet-shaped and 5-petaled flowers are yellow to white in colour. Males in long raceme while females in small clusters or sometimes solitary. These flowers are located axillary and free-flowering. The male flowers have the stamens fused to the petals while the female flowers have a superior ovary and five contorted petals loosely connected at the base. Male and female flowers are borne in the leaf axils. The males in multi-flowered dichasia and the female flowers is few-flowered dichasia. The flowers open at night and are moth-pollinated. 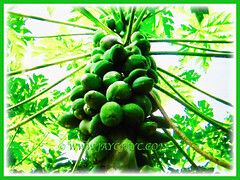 Papaya plants grow in 3 different tree types, namely male, female and hermaphrodite. The female and bisexual plants are the only ones that produce fruits. The male produces only pollen but never fruit. The female will produce small and inedible fruits unless pollinated. The hermaphrodite can self-pollinate since its flowers contain both male stamens and female ovaries. Almost all commercial papaya orchards contain only hermaphrodites. Large, fleshy and melon-like shape fruits hang in clusters and are attached to the stem top just below the leaves. Fruits are green when young and ripen to orange-yellow. Papayas are spherical or pear-shaped fruits, measuring about 15-45 cm long and 10-30 cm in diameter. It is ripe when it feels soft and its skin has attained an amber to orange shade. Their flesh is a rich orange colour with either yellow or pink colour. Each fruit contains about 20 or more black seeds. Inside the inner cavity of the fruit are black, round seeds encased in a gelatinous-like substance. Its seeds are edible although their peppery flavor is somewhat bitter. All parts of the plant contain latex in articulated laticifers. 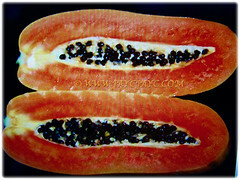 Culture (Care): Carica papaya or Pawpaw can be grown easily with least maintenance. Light: Full sun for optimum growth and fruit production. Soil: Humus-enriched, loamy and well-drained soils. Keep the soil moist but never water-logged. 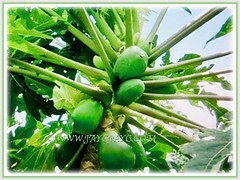 Others: For Papaya trees to thrive well, feed them with a balanced liquid fertiliser once every fortnightly. Generally free from serious pests and diseases. It is advisable to wrap or bag developing fruits until they ripen to avoid attacks from fruit flies. Watch out for papaya ring spot virus, papaya mosaic virus, fungus powdery mildew, papaya fruit fly and the two-spotted spider mite. Carica papaya or Melon Tree should be planted with some protection from wind and cold weather. In cultivation, it grows rapidly, fruiting within three years. It is highly frost-sensitive, limiting its production to tropical climates. Temperatures below -1.66°C are greatly harmful if not fatal. It prefers sandy and well-drained soil as standing water will kill the plant within 24 hours. However, in cultivation, only female plants are used since they produce a single flower each time and close to the base of the plant while the male produces multiple flowers in long stems that result in poorer quality fruit. 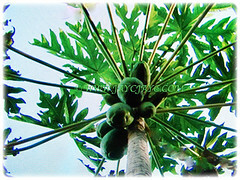 Papayas bloom in spring and the fruit matures between 3-6 months later. Propagation: Easily propagated from seeds of ripe fruit that will germinate under full sunlight in about two weeks. Only the female and bisexual plants produce fruit. Thus, advisable to plant several seeds per pot to ensure germination. 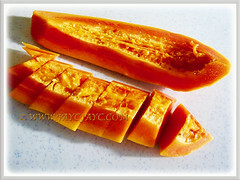 Usage: Carica papaya or Pawpaw produces edible fruits and seeds. Thus, grow them in your garden for a regular supply of pesticide-free fruits for your family. Ideal to be planted in public park and garden. Suitable to for container planting. Its very sweet and juicy fruits are eaten fresh without skin and seeds or made as ingredients in jellies, preserves or cooked as vegetables. The edible black seeds are ground and used as a substitute for black pepper due to their sharp and spicy taste. In some parts of Asia, the papaya’s young leaves are steamed and eaten like spinach. The latex is considered to be effective against toothache. The papain enzyme that is extracted from unripe Papaya’s milky sap is used as a meat tenderizer and in chewing gum production. 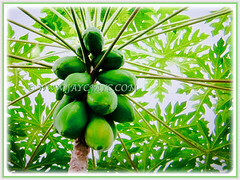 Papaya is also used in shampoos and cosmetics. 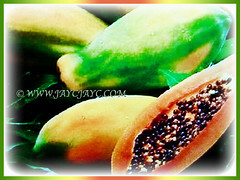 Papaya is packed with medicinal properties. It is loaded with essential nutrients and antioxidants that can reduce risk of inflammation, cancer, cardiovascular disease and diabetes, lowers blood pressure, improves healing of wounds and helps to prevent constipation and promote regularity and a healthy digestive tract. A magnet to birds and moths that are attracted to the scented flowers for pollination.